This is it. Tomorrow's the big day. The last few days here in Bangkok at CITES have been incredibly intense. The shark proposals came up first thing Monday morning, and after we [and our omnipresent giant Shark Stanleys] finished greeting delegates and headed into Committee I, we settled into what would be one of the most exceptional days of my life. It began with nerves, and an equal mix of surreptitious optimism and fear, but after the oceanic whitetip passed by a 68% majority after two hours of tense debate, we exhaled, with the rest of the day slowly escalating in momentum until the end, when, overwhelmed with elation, we saw all 4 proposals pass after the manta’s landslide victory. Yet despite this, many delegates and NGOs are confident that with the strength of the results from Committee I, the overwhelming scientific evidence behind the proposals and the immense dedication of supporting parties, the shark and manta proposals will pass. As Mamadou Diallo of WWF’s Senegal office said, “We have the opportunity to prove that CITES is a convention based on science that can achieve success despite political pressure.” Lieberman, echoed this sentiment in Committee, urging parties to adopt these proposals for both the sake of science-based decision-making and the very credibility of CITES itself. Today, in just a few short hours, this will all play out in plenary, which we’ll be livetweeting play by play. 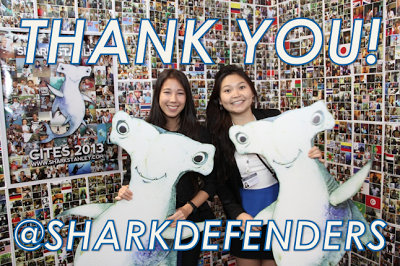 Until then, we urge you to join us in telling your CITES delegate: #StandByYourVote to adopt the shark and manta ray proposals!